Website 2 APK Builder is a reliable program that allows you to easily create an offline website browsing application for an Android system. When you wish to save the data from a website in its original form, this Java-based tool allows you to turn the entire page into an APK file, that runs on Android devices. 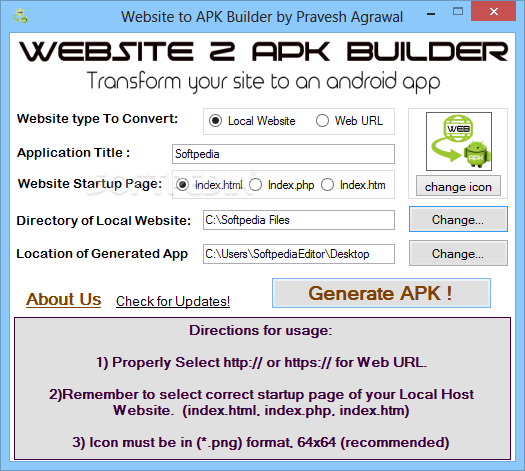 Website 2 APK Builder is simple to use, straightforward and enables you to generate an Android application within seconds. All you need to do is select the mode in which you wish to work, by uploading a local website folder or a URL. You need to choose a title for your application, then the format of the startup page. The supported index page formats include HTML, PHP, HTM, JS and CSS. Alternatively, if you select the Web URL mode, you need to specify the address and the correct prefix – HTTP or HTTPS. The incorrect choice might cause your application not to run properly. By compiling all the elements of the website into a self-standing application, the program supports the offline browsing of the site. When working with local websites, you need to specify the folder that stores all the content files: pictures, text, multimedia and other data. You may customize the icon that the APK displays in the Android environment, by selecting a photo of your preference. For suitable results, you may follow the instructions in the interface, regarding the logo picture. Once you start the building of the APK file, the program displays a notification box, with the progress bar. While the process is generally quick, it may take a long time, depending on the size of the website or that of the folder you indicated. You may also set the output directory to a path of your preference, the default option being the desktop, for your convenience.